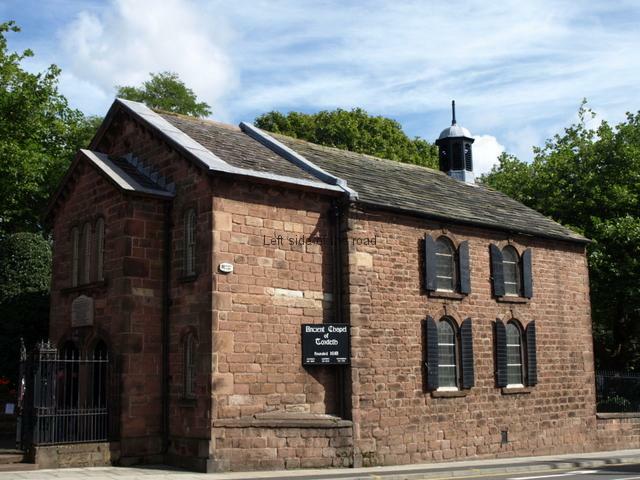 The oldest building in what is now Liverpool is the Ancient Chapel of Toxteth, a one room chapel that dates back to 1618. At that time it would have been inside the Royal Park of Toxteth which at that time would have stretched from what is now Parliament Street to Aigburth Vale. 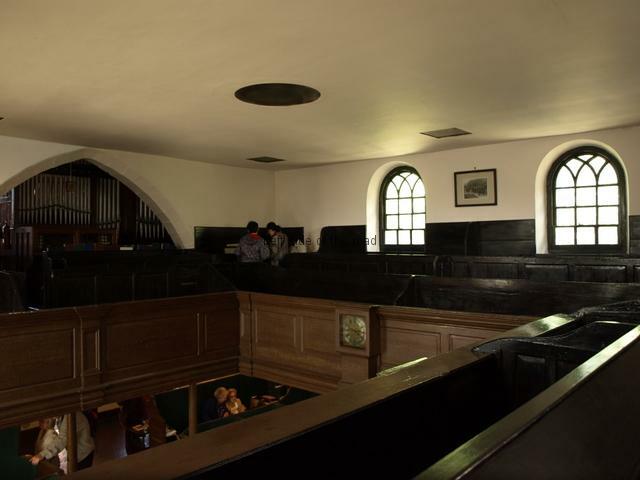 At the time it was built the Puritan style as the anti-Catholic movement was becoming more prominent and the design of the building sees the move away from an altar, The sparse decoration was also a statement against the ornateness and image laden norm in Catholic churches. 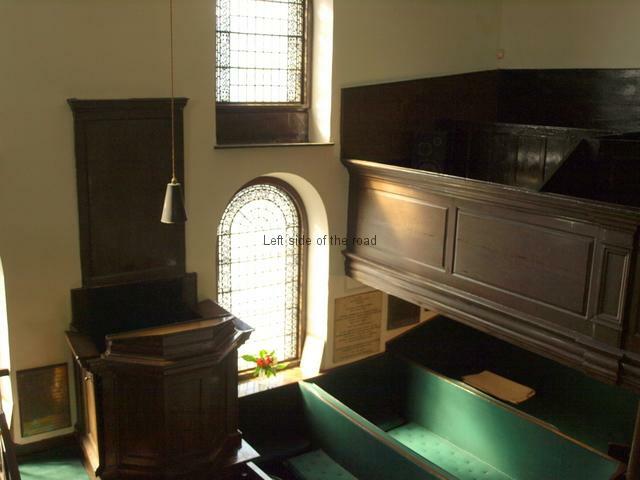 The preacher would have stood in a pulpit and the congregation sat on the three other sides – a more ‘inclusive’ approach that became familiar in Quaker Meeting Houses after the English Civil War of 1640-60. Also quite distinctive in this church is the boxed stalls instead of pews. The stalls are on two levels, the top level probably being a development from 1775 when the building was renovated. 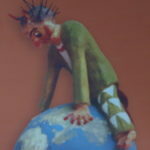 Everything is painted black or dark brown – so not a place for fun. The small cemetery at the back of the building contains a number of gravestones and monuments to a number of wealthy chapel goers. To get to the Ancient Chapel of Toxteth take the 82 bus from the centre of town and get off at the bottom of Park Road. I visited the chapel last year 2017 with my wife , we picked up a gentleman after telephoning the number on the information board on the church, who showed us around, fasinating church & history, he told us this year ,it will be celebrating its 400 year anniversary. Will you be doing anything to celebrate this event, if so could you contact me on 01704 879396, or by e,mail please. Thank you. Mr p & k Cuffe. As I’ve written before I have absolutely nothing to do with the chapel – I only wrote a blog because I thought it was an interesting building. Any queries about what they might be doing for an anniversary should be directed to the person on the end of the phone number that’s on their notice board. The Chapel has nothing to do with me – I just wrote about it. Check one of the other comment for contact details. Please let me know who I may contact to arrange a visit to The Ancient Chapel of Toxteth in late September early October 2016. Thanks. Have a look at one of the previous comments from the people at the Chapel. That provides a local telephone number for out of hours access. The Chapel has been open during the ‘Heritage Open Days’ in recent years. This year that will take place between 10th and 13th September, 2015. I’ve looked on the website (http://www.heritageopendays.org.uk/directory) but there’s nothing for the Toxteth Chapel this year. That doesn’t necessarily mean that it will not be open in September. Some places put their name down late but I slightly surprised that with only just over a month to go the Chapel isn’t on the list. All I can suggest is that you keep on checking the website and see if it gets added in the future. The problem is that, in the past, the information is not always as accurate as it really should be. If I come across any information I’ll let you know. home no is 728 8028 (resident very close to Chapel). Please PASS this info. on to enquirer/s. Many thanks:. Can you let me know if he is still working ion the chapel.